Recently I wrote an article with thoughts on the symbolism of the posture of the famous statue of Odhinn. I am sure you understood that this article is not meant to say that this is what the statue ‘means’, the article contains “thoughts on symbolism”. 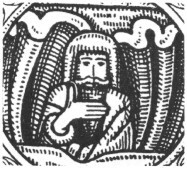 Other writers will say that this posture of Odin is a ‘cultic posture’. More funny even is that there is a statue of Thórr, found in Schmedt an der Oder (so he will have been called “Donar” or something similar), with the same posture as Odin in the statue that my other article was about. 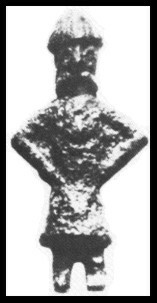 Also, Farwerck also has the image ‘little man of the year’ accompanied by the text, “idol, probably Thor”. 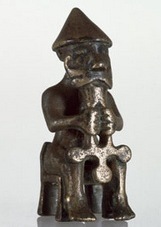 But of course, more famous is the Icelandic statue of Thor with him sitting and… and what actually? The first thought is that this statue represents Thor and his hammer Mjöllnir. Modern replicas proof that people think that this is the case, but both in the traditional and in the modern version of the statue it is not clear if the figure holds a hammer under his chin or that he holds his beard; or even, if his beard is the handle of the hammer. So let me pose some musings on the idea that the figure of Thor is holding his beard. Frans Eduard Farwerck has written a massive book called (in translation) Northern-European Mysteries and its traces to the present in which he writes about the Northern religion, folklore and traces the prechristian faith to symbolism in Medieval guilds and modern Freemasonry. 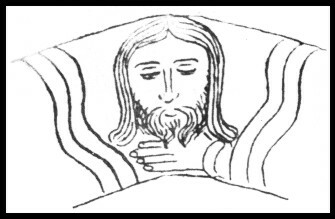 A nice chapter is about figures holding their hands under their chins or holding their beards. According to Farwerck this was a sign by which people could show that they belonged to the guild. He has collected photos and drawings of images built in churches and houses of which I give you two here. The left image is from the Stefansdom in Wien/Vienna, the other an image of Christ from the Saint Dénis church in Paris. 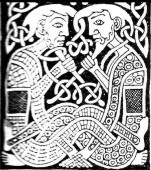 Further I can’t help thinking of the many Celtic images with male figures worked in a knotwork, holding their own or eachother beards. Decorative or symbolic? If the posture shows membership of a secret society, what does that make of Thor? Is he the example of the sign? What Thor a God of initiation? Fact is that the Mjölnir (or hammer in general) was used to sanctify marriages and probably also initiations. Usually Odin, who hang down from the windy tree for nine days, marked by a spear, is connected to initiations, but why not Thor (maybe on the second level of Dumézil’s tripartition)? Does the hand under the chin refer to Thor’s hammer maybe? Who knows, but the thought is a nice one.